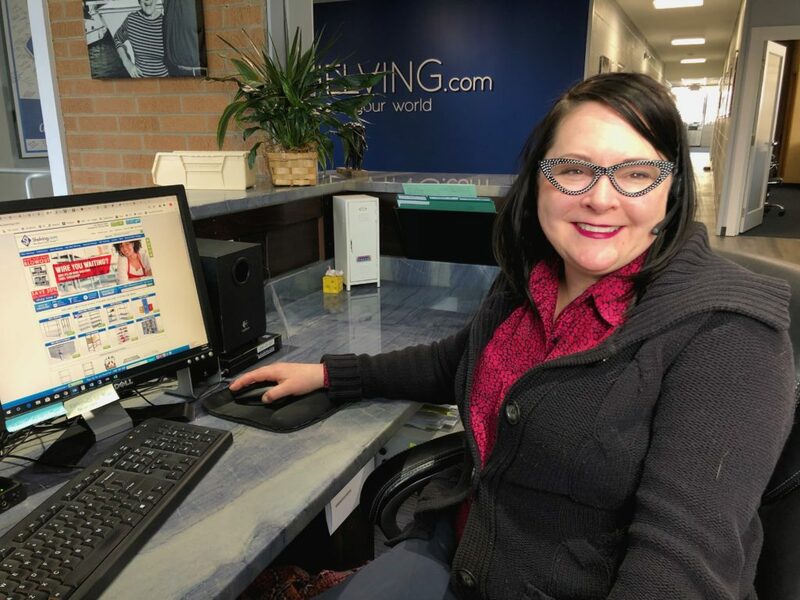 We’re back with another edition of Q&A by the Coffee Machine, where we’re taking a quick break to chat with different staff members here at Shelving, Inc.
Today we had a minute with Sarah Jacobs! Growing up in Massachusetts, Sarah moved to Michigan a few years ago. She started working in our customer service department in 2017, where she mans the phone lines and ensures all orders are exactly as they need to be. She really enjoys connecting with all of our customers, giving them personalized attention. Outside of work, she spends most of her free time remodeling and refurbishing a lovely (and exceedingly drafty) 1927 Tudor home. She also loves trying new restaurant offerings, as well as the classics, in the Detroit area. Wowed by the fantastic estate sales in the area, she’s always on the lookout for vintage cocktail and party supplies. Her hobbies also extend to teaching Monster and Ingrid to recite lines from gangster movies. They’re cats. Working here, she’s most proud of being a part of the Shelving, Inc. family and knows where she belongs.